In the wake of a betrayal that cost him everything, this player just lost the ability to even play. Today is not a good day if you're a member of Circle-of-Two (CO2). This alliance is one of the largest and most popular in EVE Online—or it was until late last night when its senior diplomat, The Judge, robbed the entire alliance blind and handed its space stations over to its worst enemies. The dust hasn't settled, but reports indicate that The Judge personally stole over a trillion ISK (EVE's in-game currency) worth of alliance ships, modules, and more. But the real kicker is that he's left CO2's players with nowhere to call home, handing their space stations over to CO2's rivals, TEST and Goonswarm. Right now, thousands of CO2 pilots are stranded in space and attempting to evacuate with whatever they can. Meanwhile, CO2's pride and joy, a Keepstar citadel that's best thought of like EVE's version of a Death Star, is under siege. And if that wasn't bad enough, CO2's leader, a legendary player by the name of 'gigX' was just permanently banned from the game. The reason? He threatened to chop off The Judge's hands. I'm not kidding. "Whoever know[s] his real name, home address and other details [message] me," gigX wrote in CO2's alliance chat populated with over 3,900 characters. Earlier this morning. Allegedly, gigX was asleep when The Judge betrayed him. Minutes later, he followed up with a serious threat. 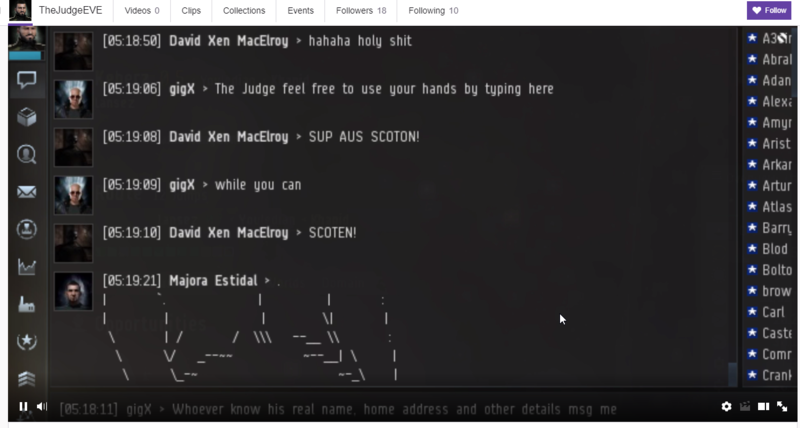 "The Judge feel free to use your hands by typing here," gigX wrote. "While you still can." 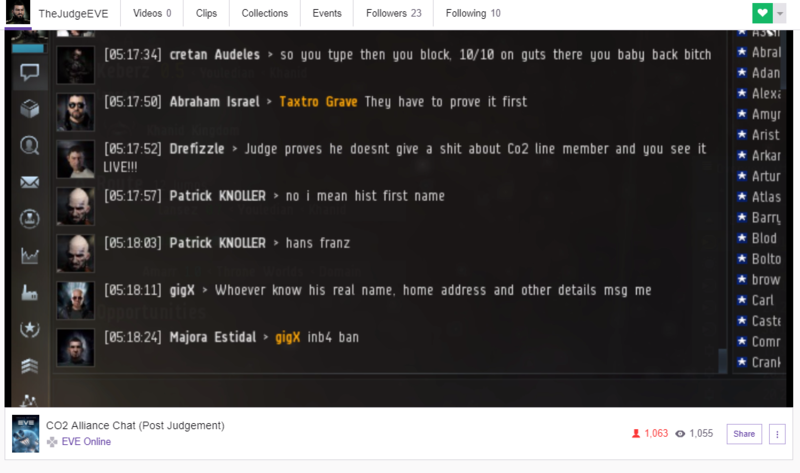 As if making the threat to Circle-of-Two's entire membership wasn't bad enough, gigX made a huge mistake in not realizing that The Judge and others were actively broadcasting the chat channel on Twitch. Anyone could see the threat, including EVE's developer CCP. In response, gigX was slapped with a permanent ban. "It is my sad duty to inform you that your accounts have been permanently banned from our server for making real life threats to another player," read the in-game notification. "This is a serious violation of our END USER LICENSE AGREEMENT and Terms of Service." Without their leader, Circle-of-Two is in serious disarray and might disintegrate entirely. It's shaping up to be one of the most explosive betrayals in EVE history, especially considering this appears to have been premeditated. According to The Mittani, the infamous leader of Goonswarm, The Judge was "flipped" by his Goonswarm agents during an in-person meeting of EVE's Counsel of Interstellar Management (CSM) in Iceland. This player-elected government helps lobby CCP to make changes to the game and is flown out to Iceland once a year to convene in person. Apparently there were some other deals being brokered on the side. We're chasing this story as we speak and hope to have a full account of what happened and why in the coming days. But for now, you can watch the ongoing siege of CO2's Keepstar here.